TERA HandheldsTERA is a new breed of communications company. They manufacture commercial-grade, affordable two-way radios for emergency communications and every land-based adventure you can think of. All TERA radios are ruggedly designed and backed with an industry leading 1 or 2 year warranty, supported in the USA. Select a Category to filter the Product list – Select a Product to view all details and options – Change the page or Product view using the controls above. TERA AccessoriesHigh-quality accessories & custom radio programming options for the TERA line of handheld GMRS MURS LMR HAM NOAA emergency two-way radios, including the TR-505, TR-500 & TR-590 radios. Select a Category to filter the Product list – Select a Product to view all details and options – Change the page or Product view using the controls above. TR-505 AccessoriesHigh-quality accessories & custom radio programming options for the TERA TR-505 handheld GMRS MURS HAM NOAA emergency two-way radio. Select a Category to change the Product list – Select a Product to view all details and options – Change the page or Product view using the controls above. TR-500 AccessoriesHigh-quality accessories & custom radio programming options for the TERA TR-500 handheld LMR Public Safety Business HAM NOAA emergency two-way radio. Select a Category to change the Product list – Select a Product to view all details and options – Change the page or Product view using the controls above. TR-590 AccessoriesHigh-quality accessories & custom radio programming options for the TERA TR-590 handheld LMR Public Safety Business HAM NOAA emergency two-way radio. Select a Category to change the Product list – Select a Product to view all details and options – Change the page or Product view using the controls above. Wouxun HandheldsWouxun manufactures commercial-grade, affordable two-way radios for emergency communications, business, recreation and Amateur Radio. All Wouxun radios are ruggedly designed and backed in the USA with a 1 year warranty. The Wouxun radios we sell have been re-designed by TERA/Powerwerx engineers to better suite the US market. Select a Category to filter the Product list – Select a Product to view all details and options – Change the page or Product view using the controls above. Wouxun AccessoriesHigh-quality accessories & custom radio programming options for the Wouxun line of handheld LMR HAM emergency two-way radios, including the KG-UV3D, KG-UV3X, KG-UV6D, KG-UV6X, KG-UV8D, KG-UV9D & KG-UV9D (Plus) radios. Select a Category to filter the Product list – Select a Product to view all details and options – Change the page or Product view using the controls above. KG-UV3D AccessoriesHigh-quality accessories & custom radio programming options for the Wouxun KG-UV3D handheld LMR HAM emergency two-way radio. Select a Category to change the Product list – Select a Product to view all details and options – Change the page or Product view using the controls above. KG-UV9D+ AccessoriesHigh-quality accessories & custom radio programming options for the Wouxun KG-UV9D (Plus) handheld HAM emergency two-way radio. Select a Category to change the Product list – Select a Product to view all details and options – Change the page or Product view using the controls above. AnyTone HandheldsAnyTone manufactures commercial-grade, affordable two-way radios for emergency communications, business, recreation and Amateur Radio DMR. All AnyTone radios are ruggedly designed and backed in the USA with a 1 year warranty. The AnyTone radios we sell have been designed specifically for the US market. Select a Category to filter the Product list – Select a Product to view all details and options – Change the page or Product view using the controls above. AT-D868UV AccessoriesHigh-quality accessories & custom radio programming options for the AnyTone AT-D868UV handheld LMR HAM DMR emergency two-way radio. Select a Category to change the Product list – Select a Product to view all details and options – Change the page or Product view using the controls above. Emergency SHTF Gear & GiftsUseful tools, supplies & gifts for your emergency or SHTF BOB (Bug Out Bag). Select a Category to filter the Product list – Select a Product to view all details and options – Change the page or Product view using the controls above. Hope for the best, prepare for the worst. 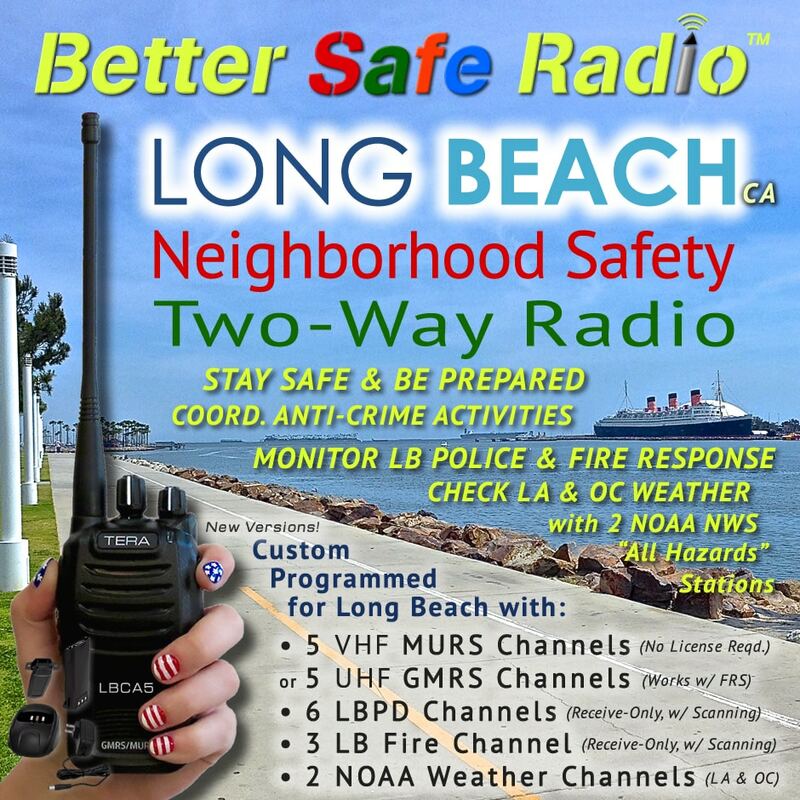 We're thrilled to present our unique Long Beach, California Neighborhood Safety Two-Way Radio! BSR Mark on Hey Dad, Buy Yourself a SHTF Two-Way Radio at 5% OFF! Lloyd London on Hey Dad, Buy Yourself a SHTF Two-Way Radio at 5% OFF! Subscribe to the 'Emergency Traffic' blog and receive notifications of new posts by email. Need Multiple Radios? — Get Up To $9 OFF Per Radio! Some items have an extended manufacturer's warranty (1-2 years on select TERA, Wouxun & AnyTone radios!) – see product pages for details. a trademark of the Internet Security Research Group.